A well-traveled performer of stage and screen is profiled in a forthcoming book by his nephew. The elderly man leaned on his walker while shuffling across the wood-stained floor, pulling behind him what amounted to his life-support system. The wheels creaked, and were severely in need of a couple of squirts of WD40. The septuagenarian took two steps, then pulled the cylindrical tank closer to him before planting the rubber knobs of the walker onto the floor. Without any other ambient noise, the action seemed to mimic a rhythmic beat that could surely be an opening for a Berry Gordy Motown number. Shuffle. Shuffle. Squeak. Thunk. Shuffle. Shuffle. Squeak. Thunk. Tom. Tom. Snare. Bass. It was disheartening watching my uncle hunched over with the oxygen tank’s plastic tubes hanging from his nose. But then it wasn’t, because I didn’t really know Keigo. Growing up, I rarely saw him, except for weddings, funerals and an occasional reunion, and when I did, interactions were limited to a mandatory hug and a few obligatory questions about school. “Michael, come over here and talk to your Uncle Keigo,” he’d say. 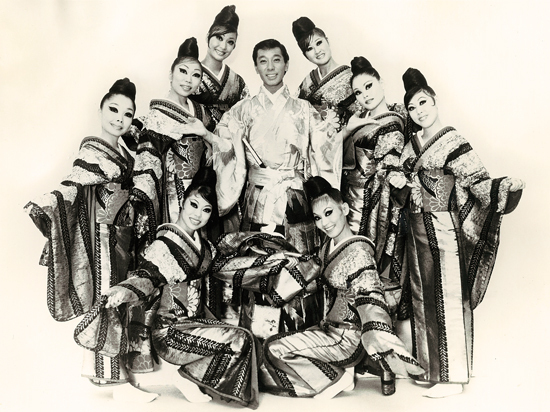 Whether in the faraway Middle Eastern lands of Baghdad, or amidst the glitz of Las Vegas lights, or on the stages of New York and Los Angeles, Keigo Takeuchi enthralled others through his dance. In his incredible three-decade-long career, his charisma and constantly upbeat personality positively affected others, enabling him to transcend the racial prejudice and homophobia of the times. And it all began inside the barbed-wire fences of the internment camps. Takeuchi, who passed away in 2008, first learned kabuki dance under the tutelage of Sahomi Tachibana when he was 10 while in the Topaz internment camp. In 1943, the family moved to Crystal City to be reunited with their patriarch, Jingo, who was released from the Lordsburg “enemy alien” camp. Keigo performed both boys’ and girls’ roles of kabuki ballet in front of thousands of people. Upon the family’s 1946 release, they eventually settled in Los Angeles, which turned out to be a fortuitous move. While at Manual Arts High School, Takeuchi met teacher Genevieve Kelso, who would guide him not only on the dance floor, but as a second mother who introduced him to the world of fine culture. There was another thing that Keigo Takeuchi came to terms with – his own homosexuality. In high school, he performed for the Brooklyn-born Peruvian singer Yma Sumac, and landed a small speaking role in “Tokyo After Dark.” It was during a bit role in the hit movie “The King and I” that the dancer was guided towards his life path. The troupe’s unique style and singular skill endeared them to other stars. 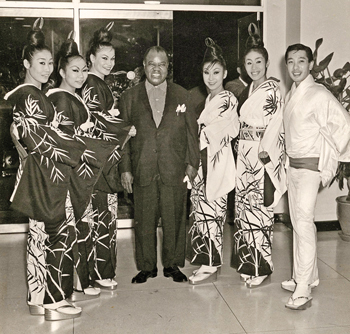 A shot from the early 1960s shows, from left: Akemi (no last name given), Yoneko Takeuchi, Antonia Ellis, Louis Armstrong, Kiyoko Binosi, Mariko (no last name), and Takeuchi. While shooting the Jerome Robbins-choreographed ballet number “The Small House of Uncle Thomas,” he met and fell for a talented, classically trained ballet dancer named Bill Lloyd. The couple’s relationship produced an added dimension when together they created the troupe Takeuchi Keigo with His Imperial Dancers. Starting in 1957, the group performed all over the world. The one-hour show would begin with a traditional Japanese number like “Soran Bushi” and then slowly evolve into Japanese-influenced numbers based on “Nelly Bly” or “Guys and Dolls,” before changing to more modern numbers. There was also a rousing version of the Charleston, done in kimono. “That number always brought the house down,” Takeuchi said with a hint of pride. Variations of the group traveled the world from one place to another throughout the year, with few breaks in between. One week they would perform in Beirut before heading off to Hong Kong for the next ballet. The troupe also performed domestically, in famed venues including Los Angeles’ Mocambo Club or New York’s Latin Quarter. Between these shows would be appearances on the “Today Show,” “The Ed Sullivan Show” and even a Washington, D.C. performance in front of then-Vice President Richard M. Nixon. On the wall of our home, there was an 8-by-10 framed black-and-white negative-image photo of a dancer going through a seemingly impossible contortion – Keigo. There were other shots of him, posing with stunningly beautiful and lithe Asian women in full costume, while they stood in front of the Colosseum or the Great Pyramids. As I grew older and more secure, my curiosity about my uncle’s dancing career grew as well. I remember spending hours going over a video of “The King and I” to see if I could spot him. In the ballet number where he supposedly could be seen, I was unable to catch a glimpse of him. Although I never saw it, I believed he was there. Despite the apparent glamour, performing two to three times a day with nary any time off was a tough lifestyle, he admitted. Remarkably, the dancers and accompanying musicians wouldn’t miss a day. It was a lesson that the dancers and singers alike learned, said Ayako Hosokawa, a singer who still performs and is currently on tour in Japan. Another constant was that for the most part, the dancers always stayed in costume and character as Japanese dancers whenever they went out, even if many of the dancers weren’t Japanese, according to Antonia Ellis, a blue-eyed Caucasian dancer from England’s Isle of Wight. “Can you picture this English girl with no exposure to the language or culture, try to speak and act Japanese?” Ellis said while laughing. Five years ago, Keigo came all the way to Los Angeles from his home in Switzerland, to attend my Auntie Florence’s funeral. He made the journey not just because Auntie Flo was his brother Joe’s wife, but also because she was a contemporary of sorts, a Juilliard-trained singer who performed on Broadway and in pre-Castro Havana. Looking at my dad and his brothers sitting in a circle at the reception that followed, I realized how everyone had changed. I realized that this would be my last chance to hear Keigo’s incredible story. Two days later, we met at my Auntie Yoneko’s house in the Los Angeles hills for the first of what I hoped would be many hours of stories. As he settled down into his seat, with his green tea and plate of chicken teriyaki and gohan, Keigo took the tubes out of his nostrils and put his hands flat on the table just as though he was about to get up. But instead of rising, he smiled serenely at me. Michael Goro Takeuchi is writing a book about this subject tentatively titled “The Imperial Dancer.” He will also launch a fundraising campaign on Kickstarter.com to offset the costs of research and production beginning Oct. 27. For more information, email him at [email protected] or call (805) 637-5762. Sounds fascinating!!! Please keep me posted as to when it’s published! !